NASA satellites show part of China’s plan to meet its ambitious new UN pledge to cut carbon emissions: solar power. On Tuesday, China said it would halt the rise in its heat-trapping emissions within 15 years and would boost its share of non-fossil fuel energy use to 20 percent by 2030. Its commitment, similar to the one it made last year in a joint U.S. agreement, comes ahead of UN climate talks in Paris in December. 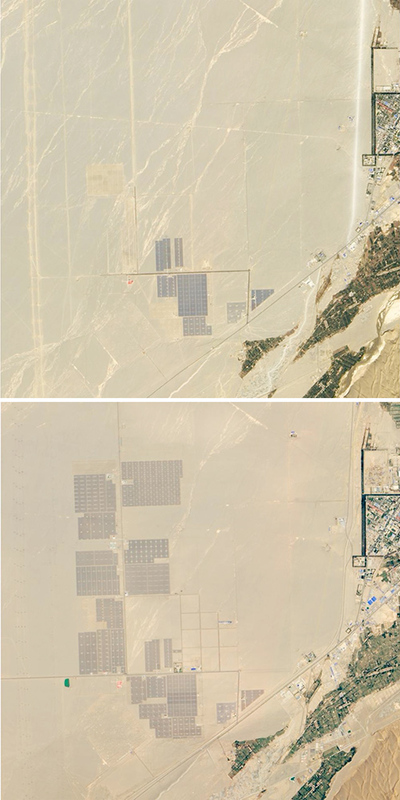 China’s goal reflects how quickly it’s becoming the world’s leader in solar power. It produces two-thirds of all solar panels, and last year, it added more solar capacity than any other country, according to the International Energy Agency or IEA. Germany still has the most cumulative photovoltaic capacity, but second-place China will likely soon close the gap. China’s spending big on renewable energy. Last year, it invested far more— a record $83.3 billion, up 39% from 2013—than any other country, according to a March report by the UN Environment Programme. The U.S., in second place, invested less than half as much. Not surprisingly, China’s posted the largest gains worldwide in power generation from renewables, including solar, reports the most recent BP Statistical Review of World Energy. “China is largely motivated by its strong national interests to tackle persistent air pollution problems, limit climate impacts and expand its renewable energy job force,” says Jennifer Morgan, director of the climate program at the World Resources Institute. She says China, now the world’s largest emitter of greenhouse gases, can meet its climate pledge if it continues its renewables’ push. China appears ready to set a more ambitious climate change pledge by moving up the timeline for peaking its carbon emissions and opening the possibility of sending money to other countries to take action, according to EU sources close to the negotiations. The declaration is expected no later than Tuesday, following parallel summits with China and the EU in Brussels, and in New York with United Nations members. “We are making great efforts to bring about a revolution,” said Xie, noting that as of 2014, China had reduced its emissions by 33.8 percent compared with 2005 and that it aims to reach 45 percent by 2020. China is expected to make an announcement that takes it beyond the broad-stroke targets for 2030, and offers more specifics on what it will do to curb climate change, EU sources told POLITICO. In particular, Beijing is expected to state more explicitly that China’s emissions will hit their highest point before 2030, as they are already on track to do. It could say it will eventually join developed countries in financing climate action and adaptation in developing countries, and eventually link its nascent emissions trading system (ETS) to other international markets. The falling coal import trend started in 2014. It’s continuing well into 2015 with greater force. In the first five months of 2015, China’s coal imports fell by 38.2%—compared to the same period last year. Imports in May came in at 14.25 million tons—a huge fall of 41% YoY (year-over-year). In comparison, April’s coal imports were 19.95 million tons. Industry experts think that a 30%–40% fall could be prevalent through at least 1H15. Slowing economic activity and strong hydro-power generation are the major reasons for China’s drop in coal imports. Policy changes related to the use of cleaner energy sources have also impacted coal consumption. Due to all of these factors, domestic coal consumption in China is expected to drop by 5% in 2015. Back in June 2013 Wood Mackenzie, a high-profile mining and energy consultancy favoured by the coal industry, boldly proclaimed that Chinese thermal coal demand would double to approximately 7 billion tonnes a year by 2030. Just on two years later it is clear that the company hopelessly over-estimated crucial factors affecting demand, not least the determination of the Chinese Government to take decisive action on the country’s appalling air pollution. On Tuesday, Brazil and the United States announced a joint effort to address climate change and boost renewable energy during a visit by Brazilian President Dilma Rousseff to the White House. Specifically, both countries pledged to increase renewable energy targets to 20 percent by 2030. The target excludes hydropower, an especially contentious power source in Brazil, where large and valuable ecosystems can be flooded out to make way for reservoirs. Brazil also committed to restore and reforest 12 million hectares — an area roughly the size of Pennsylvania — and to eliminate illegal deforestation. “The environmental agenda is absolutely key and essential for our two countries,” Rousseff said during a press conference Tuesday afternoon. She also vowed to fight for an “ambitious” climate agreement when international leaders and negotiators gather in Paris for a climate summit at the end of the year. The joint pledge came within hours of China’s official submission of its climate targets to the United Nations in preparation for the Paris climate summit, making Tuesday a significant milestone in global efforts to build momentum for a global treaty to fight climate change. That treaty is set to be agreed upon at the end of 2015, and should go into effect after 2020. The Belo Monte dam, currently under construction, will flood 1,500 square kilometers of rainforest — an area larger than New York City — and displace 40,000 indigenous people. Federal prosecutors recently determined the those constructing the dam, which would be the world’s third-largest hydroelectric energy producer, had violated agreed-to terms regarding the relocation of locals. Clean energy currently represents about seven percent of the United States’ power sector, excluding hydropower, so meeting the target will involve tripling renewable energy capacity in the next 15 years. The EIA expects nonhydropower renewable power generation to increase 6.9 percent in 2015. While solar power production will grow rapidly, energy from wind, biomass, and biofuel will make up the largest percentages. China is aiming to peak its carbon dioxide (CO2) emissions “around 2030” and will make “best efforts” to peak early, its climate pledge to the UN confirms. China’s intended nationally determined contribution (INDC) includes a new target to reduce its carbon intensity by 60-65% of 2005 levels by 2030. Carbon Brief analysis suggests the top end of this range would see CO2 peaking in 2027. China also says it will source 20% of its energy in 2030 from low-carbon sources. The announcement, which adds to existing Chinese commitments, came on a busy day on Tuesday for climate pledges. South Korea, Serbia and Iceland all filed INDCs with the UN, bringing the share of global emissions covered by pledges to nearly 56%. Tuesday also saw Brazil and the US announce new commitments to renewable energy at a joint summit in Washington. Either that’s a large error in translation/reporting, or the Chinese representative told one heck of a whopper, because the 33.8 emissions reduction from 2005 levels makes zero sense. Thermal power (i.e. fossil carbon) in that figure accounts for 67% of that – the rest is mostly hydro, with wind, nuclear, and some solar. So, that’s 3.7 trillion kWh from fossil carbon sources. So, that’s 11 trillion kWh in 2030. Let’s say the renewables growth takes a straight 20% off the top of that current 67% (which isn’t reasonable, but say it does), so thermal power then accounts for 47% of China’s mix, which means it’s using 5.17 trillion kWh of fossil carbon in 2030, a rise of about 1.5 trillion kWh in thermal power from now. This doesn’t include transport, which is also expected to grow rapidly to 2030. Do we have any sense of scale for the PV panel installation? Just curious. They’re pretty darn big. Take a look here for scale bars. China also added 47 GW of thermal power in 2014 alone. It uses a current total of 915 GW thermal power and 28 GW solar power. Floating solar power systems are wonderful ideas for Brazil. But it’s very important to maintain effectively same direction and position on the water for floating solar plants. Because directional change of solar panels reduces electricity production. So floating solar plants also need the directional control mooring systems for their parked positions. Azimuth and position change of floating solar plants caused by wind, waves and external forces. Restoring Force Strengthened Mooring System for floating solar plants has been created in South Korea. This Mooring System generates Restoring Force immediately when floating solar plants are being rotated or moved on the water. jimbills has already pointed out some of the whacky math used here as people try to employ the power of positive thinking and bright-sidedness. Let me add to that. Somewhere around 40% reduction in Chinese coal imports in the first quarter? (I say “somewhere” because you can find figures ranging from 37% to 42%). Has anyone noticed that Chinese domestic coal production dropped only 6% during the same time period? Consider that China annually imports ~200 million tons of coal and produces domestically ~4 billion tons. Can you do the math, children? Only around 1/20th of the coal China uses is imported, and that makes the 40% reduction in IMPORTS almost meaningless. Because of the slowdown in the Chinese economy, it’s true that they are using less coal, but they’re cutting way back on the “high-priced spread” from abroad and relying on the cheaper hime-grwon stuff—-that’s just smart business. Also consider that China’s coal production tripled from 2000 to 2014, and that China generates ~2/3 of its electricity from coal. Also consider that China’s total CO2 emissions doubled from 5 billion tons in 2005 to 10 billion tons in 2010. Yeah, 2005 was a good year to cherry-pick for a target. It’s good that we are seeing some progress, but I’ll believe it only after the Paris talks get EVERYONE on board, and in the year or two after that when things really start to happen (if they happen, that is). I will remind everyone of INDIA, a country that is about to follow the path China took a decade or two ago. Projections and number games don’t cut it when the CO2 goes up 2 or 3 ppm every year. We will likely be ~435 in 2030 and ~480 in 2050, and the 2 degree target may be disappearing in the rear view mirror.